When Captain John Grant first built Easter Elchies House in 1700 in the heart of Scotland’s Speyside, never would he have thought that it would become the production site of one of the world’s leading single malt whiskies centuries later. Captain John Grant, who fought on the side of the royalists in the battle of Cromdale during the Scotland’s Jacobite uprising, had his Highland manor house built from locally quarried sandstone in a fine example of Scottish architecture of the period, complete with crow-stepped gables and a turret. Over a century later, in 1824, the estate around the grounds in which Easter Elchies House sat was leased to a local farmer and schoolteacher, Alexander Reid, who established The Macallan distillery on that very site. Reid was particularly attracted by the area’s pristine environment and its potential for making whisky; the ground was fertile with alluvial soil perfect for growing barley, and the River Spey – which has the purest water in the entire British Isles – bordered the south side of the estate and could easily provide the water that his distillery would need. For centuries Speyside farmers have been distilling whisky – many of them rather illicitly – but Reid had acquired a license to do so legally, and The Macallan was thus born. The name Macallan is likely to be derived from two Gaelic words, “Magh” referring to a piece of fertile ground, and ‘Ellan’ means ‘of St Fillan’, an Irish monk who travelled widely in Scotland spreading Christianity during the 8th century. The Macallan estate itself covers some 390 acres (158 hectares). Part of that – some 90 acres of it, in fact – is still used for farming its exclusive Minstrel barley variety, which goes into the making of the spirit (most of the barley used by other distilleries are of the Concerto variant) and is partly attributed for spirit’s rich oiliness. As was in the days of yore, the barley would be sown in spring, grown throughout the summer months and then harvested in early autumn. A single acre will produce nearly two and a half tons of barley, which will yield some 1,800 bottles of The Macallan. In Alexander Reid’s days his surplus barley would be converted into whisky during the quiet and cold winter months; these days the estate’s farm don’t quite nearly provide the barley the distillery needs – it contracts over 40 farmers in the east of Scotland and in Northumberland, northern England to grow Minstrel barley, and also use the more common Concerto – and its stills run pretty much every single day of the year. Easter Elchies House is so important to the Macallan story that its silhouette adorns every single bottle of whisky that the distillery produces, but interestingly the manor house was never owned by the distillery until 1961, when the distillery purchased the house and the estate on which it sat. The company refurbished Easter Elchies House, and opened it to the public in 1985. Today The Macallan’s spiritual home forms one of the six key pillars for The Macallan brand, and the manor’s dining room regularly hosts meetings and tastings with VIPs and other special guests. How important to The Macallan is Easter Elchies House exactly? Consider its collaboration with legendary French luxury glassmaker to create “The Spiritual Home”, the fifth in The Macallan in Lalique Six Pillars Collection, an exquisite and rare 62-year old single malt housed in a unique crystal decanter. Lalique’s Marc Larminaux faithfully recreated the harled surface applied to the sandstone walls of the manor with a textured frosted surface on three sides of the decanter; there’s even a replica of the manor’s date stone set on the base of one of those sides, complete with the date and Captain John Grant’s initials. The distinctive crow-steps at the gable ends of the house have also been interpreted with the steps on the neck of the decanter. When it was first launched in Singapore in early 2014, its recommended selling price was an impressive S$33,000. Now the size and shape of a distillery’s stills matter – these stills set the DNA of a distillery’s new-make spirit that ultimately defines the character of its whisky. Visitors to The Macallan distillery may notice that The Macallan’s 14 copper spirit stills are somewhat on the wee side; in fact they are the smallest on Speyside. The unique size and shape of The Macallan’s curiously small stills gives the spirit maximum contact with the metal, which acts as a catalyst during the distillation process for the formation of esters – those naturally occurring chemical compounds which reacts with water to create alcohol – that helps to concentrate the new-make spirit and contributes to the viscosity and rich, fruity, full-bodied flavours that’s so characteristic of The Macallan. The copper also helps clarify the spirit, allowing its natural aromas to shine through. The small spirit stills at The Macallan are so famous that they have appeared on the back of a Bank of Scotland £10 banknote. The distillation process for most Scottish whiskies takes place in two distinct stages, and each in a different kind of still. The first phase happens in the wash still, which – by taking advantage of the different boiling points of ethanol and water – heats up a base of barley mash to yield alcohol-heavy vapours that is then circulated out of the still into condensers as low wine. That low wine, which is around 21 to 23 percent alcohol by volume (ABV), is then channeled into a spirit still – which is generally smaller than a wash still – for a second distillation phase. The distillate that condenses out of the spirit still is then separated for its “heart”, or the best part of the new spirit, and set aside, ready to be stored in oak casks. The Macallan only takes 16% of that colourless final distillate, which it calls the finest cut, from the spirit stills to be aged. And then there are the wood barrels in which the whisky is aged. 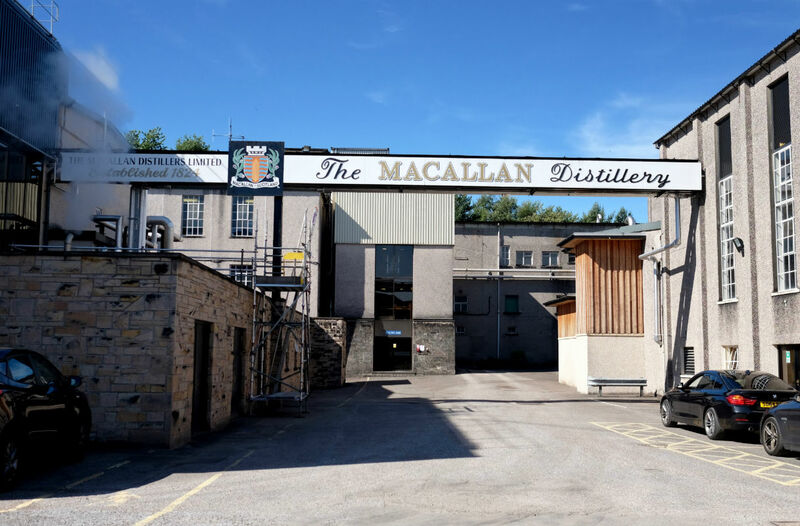 When the privately-held Edrington Group took ownership of The Macallan in the late 1990s, it introduced a comprehensive wood policy for the distillery. It had been getting increasingly difficult to get their hands on sherry casks – considered to be among the best to age whisky in – so the distillery took the bold step and decided to go right to the source. Today it works with wood producers from eastern United States and northern Spain to purchase the raw wood that would go to cooperages in Spain such as Tevasa, Vasyma and Hudosa, to be turned into casks. These casks are then sent to various sherry bodegas in Jerez to be seasoned with sherry for up to 18 months, before they are emptied and shipped to the distillery as exceptional oak casks. 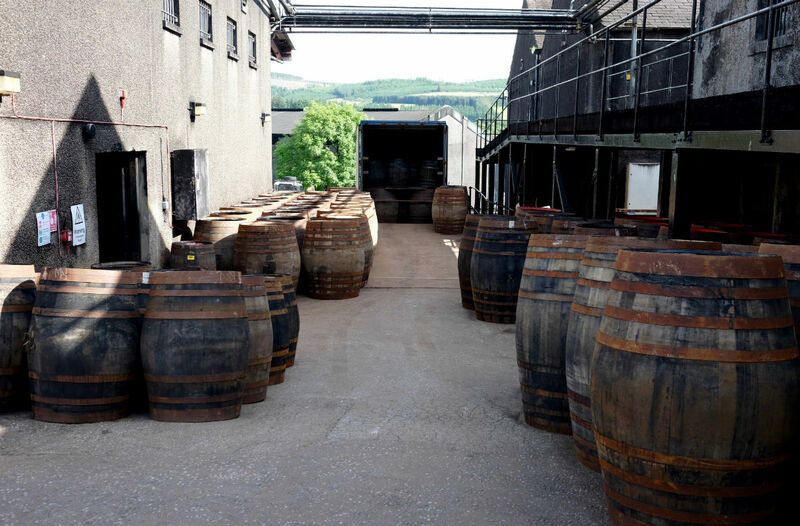 These casks are then filled with the new-make spirit, and stored in dunnage warehouses. “Wood sits at the very heart of what we do at The Macallan,” asserts Stuart MacPherson, the whisky brand’s Master of Wood. His team of 25 – the largest amongst all Scottish distilleries – oversees the entire process from selecting the wood that goes to cooperages to be made into casks, to maintaining the casks as they age in the warehouses. Wood is a living product, so not only does the species of oak matter – oak, due to its porosity is generally considered to be the best for the purpose of storing and aging whiskies – but each species of tree can vastly differ from another. What each cask previously stored also has an influence on the final notes found in the product. For example, a Spanish oak cask that has previously stored or been seasoned with sherry tends to give aromas and flavours reminiscent of dried fruit, chocolate orange, and sweet spices. An American oak cask treated with sherry provides notes of sweet citrus, light spice, vanilla and light oakiness; on the other hand an American oak barrel that previously held bourbon exudes sweet citrus and oak but also coconut. Those quality oak maturation casks is also responsible for the natural colour in The Macallan, the interaction of the new-make spirit with the oak of the maturation casks delivers the rich and natural diversity of colour throughout the range, from light oak through to darkest mahogany. It goes without saying that the better the quality of the oak casks used to age the spirit, the better the flavours in the final product. The Macallan alone accounts for some 65% of fresh sherry seasoned oak casks, the most expensive of all, imported into Scotland for maturing whisky. This is important because each permutation – depending the kind of oak, the source of that oak, the shape of the cask, the cooperage that converts the raw wood into casks, and the spirit previously held in that cask – is what is called a cask profile, so the whisky aged in each of these casks can exhibit totally different characteristics. It is then up to the skill of the master whisky blender to carefully select from different casks to create a desired whisky expression. For example, master blender Bob Dalgarno selected spirits from 16 different cask profiles – ranging from different wood species, different cask manufacturers and engaging different established sherry bodegas – in 256 casks out of around 200,000 in its warehouses to blend and create the recently launched Macallan Rare Cask. Between the heritage and history behind Easter Elchies House, the distillery’s curiously small spirit stills, its selection of only the finest cut of new make spirit, the wood policy behind acquiring the exceptional oak casks that provide not only the best flavours but also the natural colours that define its whiskies, it is The Macallan itself that has led it being one of the largest premium malt Scotch whisky brands in the world and one that’s sold in over 70 markets across the globe. If you visit The Macallan in the heart of Speyside today, you might find that Easter Elchies House – Captain John Grant’s old home and The Macallan’s spiritual one – sits amidst a whirlwind of activity as the distillery seeks to expand its operations to meet that global demand. But you can be certain that one thing is unlikely to change, and that is The Macallan’s peerless spirit. This article was first written for and published in the inaugural edition of Cask&Drams, Singapore’s first whisky-focused magazine.